The new Barbies will reflect different body types, hair textures and physical disabilities. Barbie is expanding her group of friends, featuring its most inclusive lineup yet. Mattel, parent company of Barbie, said its expanding the Barbie Fashionistas line this year to include even more dolls to better represent girls throughout the world. 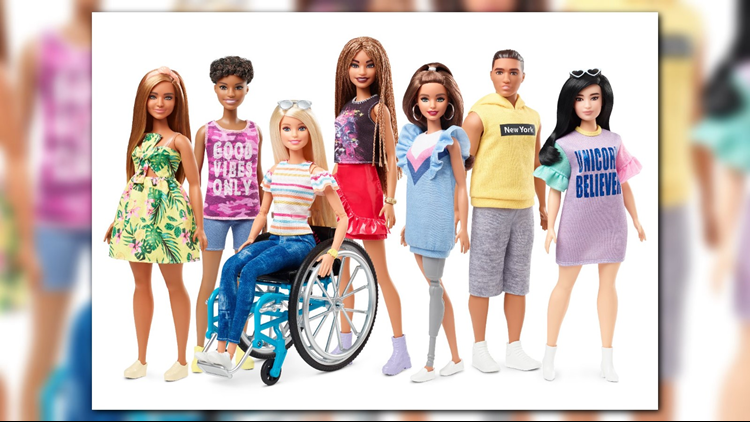 This year's new additions will include a new braided hair texture, a new body type for Barbie with a smaller bust, less defined waist and more defined arms, and new dolls that reflect physical disabilities, including a doll in a wheelchair and a doll with a prosthetic limb. The company said they collaborated with UCLA Mattel Children’s Hospital and wheelchair experts to ensure authenticity in their product development. The toy wheelchair is modeled after a real, rigid frame wheelchair. They also worked with Jordan Reeves, a 13-year-old from Missouri and co-founder of "Born Just Right", to develop the doll with a prosthetic limb. According to Mattel, the doll will also incorporate a key design feature to remove the prosthetic leg for a more realistic experience.